Shanghai Balance International Trade Co., Ltd.
Wuhan Golden Future Technology Development Co., Ltd.
Yiwu Bory Optics Co., Ltd.
With high quality products and service has made domestic and foreign customers trust and support. 2: How long is your delivery time9 A: Generally it is 1-3 days if the goods are in stock. or it is 4-5 days if the goods are not in stock, it is according to quantity. Foshan Focus Sport Co., Ltd.
Zhangjiagang Gangmei Sport Devices Co., Ltd.
To Save your time, welcome to our homepag e to get more guideline please. According to the guild regulations customer shall be responsible for the returning shipping fee. All scopes and items have five years warranty . Q : Can we be your wholesaler or distributor 9 Yes, welcome And we will offer more reasonable price for all wholesaler, distributor, dealer, and reseller . Q: Can I order one piece for sample to test the quality9 A: Yes, We recommend checking the sample before order. We are the professional manufacturer and wholesale distrbutor focus on outdoor sporting goods and accessories located at mainland China for more than 10years. All our products are tested before being shipped, ensuring that our customers receive only the best products. We have set the standard in quality, speed, and customer service for four years. 4. What's the delivery time9 A: For products that are in stock, we deliver it within 3 days after order confirmed. 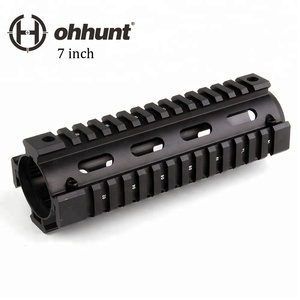 Drop Ship Tactical Hunting Shooting AR-15 M4 Rifle RAS Carbine Picatinny Quad Rail Free Float Handguard Rail System Specifications: 1. 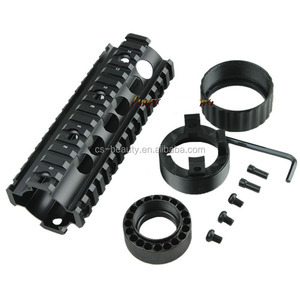 Four military picatinny rails for the installation of flashlight, laser and red dot sight scope and so on. 2. 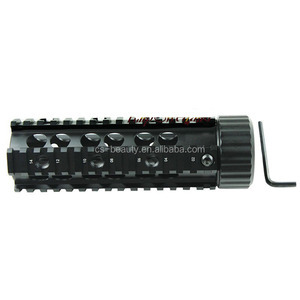 Full Length: 180mm (7.1 inch) 3. Net Weight : 315g (11.1 ounce) 4. Lower rail style with CNC precision 5. Easy installation with light weight 6. High-durability aluminum alloy in black matt and nice finish 7. Shock proof can be used on real fire caliber Shipment: Free shipping service only apply to ePacket or post air mail, if you want faster shipment, please contact us before payment. Thank you!